Uses: Church, Religious Lengths: 11 panel 20'-5" Heights: 6'-0"
Studies have shown that nursing home residents thrive through interaction with individuals and the constant stimulation of the mind and spirit. With this in mind, it is important to create a room for nursing home residents to gather for collective worship each week. 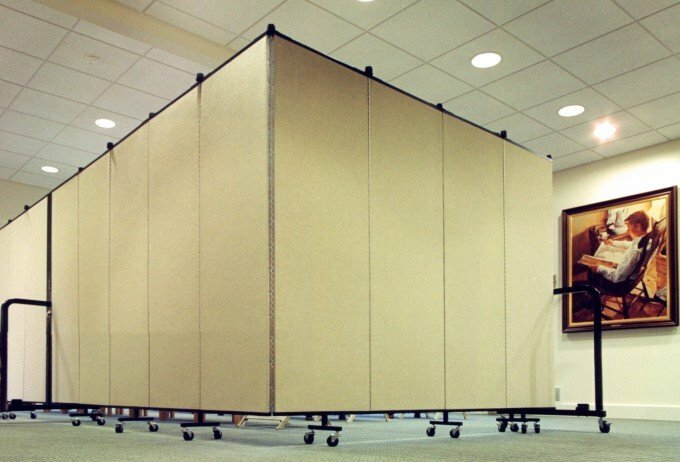 This nursing home uses Screenflex Room Dividers to create a church in their multipurpose room. Because many residents look for visual clues to identify the space as a church, hang religious images and meaningful symbols on the fabric walls. Items can be tacked or stapled directly on the panels without damaging the fabric. For heavy items consider purchasing the Screenflex Artwork hanger. This 45” long steel hook installs by placing the hanger over the top of any Screenflex Room Divider. Or add an antimicrobial coating to the units to help prevent germs from spreading.